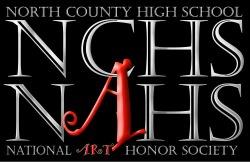 North CountyNat'l Art Honor Society - MEETINGS! Date is Saturday April 21st (a great way to get a ton of hours) -- earn up to 8 hours! We’re collecting bottle caps (all sizes and colors, CLEAN) for Mr. O’donnell. 1 hour for every 100 you turn in (up to 500). Bring them CLEAN and bagged to Mrs. Roemer directly to earn your hours. Portraits are due back! We’ve received 3 of the 12 that we signed out, and Mrs. Roemer is panicking. Please submit your finished artworks! If you need to submit the money late, that’s OK! Today we will be distributing designs that were turned in along with a canvas. We’re still missing quite a few, and have sad teachers! INDUCTION CEREMONY - Official Date is May 17th. Put it in your calendar NOW! Please sign up on signupgenius (link on our website) or via Google Classroom for the Potluck dinner happening the night of the induction ceremony! I know it seems far away, but it’s VERY SOON! (we only have 2 more meetings before the induction ceremony! Officer applications will be available on google classroom by the end of this week. If you’re interested in being on the officer team, and spending way too much time with Mrs. Roemer, please sign up on Sign-up Genius so we can add your name to the ballot. Elections will be held on May 15th, 2018, and elected leaders will be announced at the induction ceremony. sign up for activities to earn at least 12 hrs total before April 12th(end of second marking period)! If you are new, you should be aiming to have 20 hours by that date.) ALL HOURS MUST BE COMPLETED BY MAY 1st to be inducted! Sign up to run for an NAHS officer position for next year! If you have not submitted your grades for a grade check, please do so today at the end of the meeting. We’re collecting bottle caps (all sizes and colors, CLEAN) for Mr. O’donnell. 1 hour for every 100 you turn in (up to 500 caps). Bring them CLEAN and bagged to Mrs. Roemer directly to earn your hours. A $15 donation is needed for each portrait to cover shipping and handling and foundation costs. Due to ACTs, the next general meeting on March 20th is cancelled. It will be moved to March 13th ( next week) instead. Official Date is May 17th. Put it in your calendar NOW! We will be checking grades; both 1st and 2nd marking period. A $15 donation is needed for each portrait to cover shipping and handling and foundation costs. We’ll be creating donor forms to get donations from family/friends/faculty shortly. This is NOT an hours opportunity, it is a contest/money-making opportunity! NEXT MEETING - is not until FEBRUARY 20th! Please keep a close eye on Google Classroom, as we will likely have some hours opportunities during the month of February/March that you will want to be aware of. Meeting requirement for Jan/Feb will be combined. So you need one meeting during the months of Jan/Feb. Meeting Attendance - You must sign in on the paper up front to get credit for showing up to a meeting. If your name is not listed, then please write it at the top or the bottom. We cannot continue to guess whether or not you were actually at the meeting. Contracts and dues were due Nov 7th! Final deadline is JAN 9th MEETING. If you sold any tickets, make sure to turn in the money by THURSDAY so we have plenty of supplies/food! If you are working the event: use the Auditorium entrance to enter the building, if you have an apron, bring it! Please update your attendance on Sign-Up genius so we can better plan helpers! Make posters! info for posters is listed below. please turn them in to Roemer by FRIDAY morning. We'll hang them around the building that afternoon! Make “artsy” food to earn hours! Artwork from Foundations Thru AP! Mini-masterpiece silent auction ends at 6:30pm! December 19, 2017 - Last meeting of 2017! WARNING LETTERS ARE GOING OUT THIS WEEK! You can earn an hour just by donating blood! Must be 16, no fresh tattoos. Get permission slips from Mrs. Roemer and turn in to Noplos in K204! Help sell tickets! It’s an NYC trip fundraiser, but if it’s a success, we will do it for an NAHS fundraiser… which means, we need to sell tickets! Come see Roemer after the meeting if you would like to sell tickets! It has been rescheduled to be on Saturday, 1/13. All $$ from ticket sales and all unsold tickets should be returned to Mrs. Roemer or Ms. Bittman by 1/11 so we know how many canvases to buy! Finished paintings are due back JANUARY 2nd! Grab your canvas if you haven’t already! You are welcome to coordinate staying after with Mrs. Roemer or Ms. Lehrmann to work on them in classrooms, and use the acrylic paints we have..
We’ll need help setting up the two days prior, and breaking down, too. Keep an eye out for sign-ups on our website! All forms and money are due back TODAY DECEMBER 19th. ALL CHECKS MUST BE DATED DECEMBER 19th OR WILL NOT BE ACCEPTED! CLUB PHOTOS Our photo session is DECEMBER 6th at 7:30a (the very beginning of the day! Please meet in the auditorium. Remember, there will NOT be remind text message that day, so it’s important you remember yourself! Pick up your pass BEFORE you leave the meeting today. Ms. Lehrmann has them! Brunch & Brush Help sell tickets! It’s an NYC trip fundraiser, but if it’s a success, we will do it for an NAHS fundraiser… which means, we need to sell tickets! Come see Roemer after the meeting if you would like to sell tickets! All $$ from ticket sales and all unsold tickets should be returned to Mrs. Roemer or Ms. Bittman by THIS THURSDAY 12/7 so we know how many canvases to buy! MINI MASTERPIECES Starting today! Canvases won’t be here until FRIDAY but you can reserve your painting today, and then come see Roemer on Friday to grab your canvas! Finished paintings are due back JANUARY 2nd! You are welcome to coordinate staying after with Mrs. Roemer or Ms. Lehrmann to work on them in classrooms, and use the acrylic paints we have..
WINTER ART SHOW Jan 17th-19th Evening Reception 1/18 Reserve the dates on your calendar We’ll need help setting up the two days prior, and breaking down, too. Keep an eye out for sign-ups on our website! Brunch & Brush Fundraiser for the NYC trip; NAHS members that aren’t going to NYC can help fundraise money towards senior scholarships! Hours opportunity for all members! See flyer to help sell tickets (All ticket sales end on December 7th so we have time to coordinate materials!) Dec 9th, 8a-2pm (actual event runs from 10-1) If you are working the event: use the Auditorium entrance to enter the building, if you have an apron, bring it! Adopt-an-Artist Design Congratulations to Jessica Schneck for creating the winning design! Thank you to everyone who voted on the colors We’re distributing forms today. You get $5 off ONE item of your choice. (member discount) All forms and money are due back DECEMBER 19th. ALL CHECKS MUST BE DATED DECEMBER 19th OR WILL NOT BE ACCEPTED! Teacher Portrait Prototypes If you signed up, please follow the link sent to the email you submitted to choose the portrait you are doing We’d like those portraits to be done by asap (end of next week) so we can start figuring out the selling piece! Contracts and dues were due Nov 7th! Please get them in asap! Our photo session is DECEMBER 6th at 7:30a (the very beginning of the day! Please meet in the auditorium. Remember, there will NOT be remind text message that day, so it’s important you remember yourself! Be a teacher! We need 3-6 volunteers to TEACH the paintings (Roemer & Lehrmann are also teaching two paintings) We’ll stay after school on Dec 5th (next Tuesday) to do a practice run. I promise, it’s easier than it looks! Earn hours for staying after on Tuesday, and an extra hour for teaching on the day of the Brunch & Brush event! SEE ROEMER to SIGN UP! The first Juried Exhibition is opening up this THURSDAY with an artist’s reception! Come to Paradise Donuts in Linthicum from 5-6pm, and earn an hour just for being there! I’ll also buy a dozen donuts and the first 12 students to show up get a free donut! Stay after school to help finish them up! Starts NEXT WEEK! Come to the meeting on Dec 5th to pick out your painting and get your canvas. If you have a specific painting in mind, email the image and title/artist to Mrs. Roemer jroemer@aacps.org BEFORE Dec. 5th, and we will reserve it for you! POPCORN sales were due yesterday! If you still have them you need to get them in today!!! Fundraiser for the NYC trip; tickets are already being sold! Sell tickets and help us market this event so we can do it again next year! Congratulations to Jessica Schneck for creating the winning design! Roemer will have order forms for you by the end of the week! We’d like those portraits to be done by asap (end of next week) so we can start figuring out the selling piece! submit your contract and member dues to an officer, they were due last meeting! sign up for activities to earn at least 8 hrs total before January 30th(end of second marking period)! Contracts and dues are due today! If you have not gotten them in they are due as soon as possible! If you miss too many meetings, or if you don’t earn the hours you need for a marking period, you will be placed on “probation” YOU ARE NOT INSTANTLY KICKED OUT OF THE SOCIETY. Create a design for a mural going up at Johns Hopkins Health Care Center! We will be going to New York with the Drama dept. Fri March 23rd to Sat March 24th. We will be visiting two museums and two broadway shows! The price varies from $550 to $500 depending on how many people sign up. There will be SEVERAL fundraisers to help reduce the costs! Popcorn sales: WE ARE NOW SELLING POPCORN, get more information at the end of the meeting! We’d like those portraits to be done by next week so we can start figuring out the selling piece! submit your contract and member dues to an officer, they are due today! Turn in your $100 or contract to hold your spot for our epic trip to New York! Submit artwork by this Friday for the Paradise Donuts juried exhibition! First General Meeting of 2017-2018! SPIRIT WEEK: Thank you to all who participated! We had so much fun! Dues depend on how many years you’ve been with NAHS. If it is your FOURTH year, you’re free! If it is your SECOND or THIRD year, dues are $5. If it is your FIRST YEAR, dues are $10. If it’s your FIRST YEAR, and you are a SENIOR dues are $15. Must earn at least 4hrs per marking period to maintain membership! Submit your artwork for the competition (to go on display) -- bring it to the next meeting! The winner gets a FREE T-SHIRT! We need prototypes to help us advertise (sign up with Roemer during meeting to create one - 8”x10”) and earn hours! Design our next Adopt-An-Artist T-shirt! Turn in you $100 to hold your spot for our epic trip to New York! Submit artwork by 11/7 for the Paradise Donuts juried exhibition!